At Viavi Solutions® we’ve had the benefit of observing a number of hybrid cloud deployments up close. All sectors of IT users from small to large enterprises, governmental groups, and even cloud service providers (CSPs) who themselves have begun to offer managed cloud services from third-party platforms—touch the hybrid cloud environment. CIOs, especially, face new challenges in deploying or expanding their enterprise presence in the cloud. This white paper examines four critical areas—migration, security, costs, and visibility—where CIOs can make major differences in the successful execution of hybrid cloud strategies. 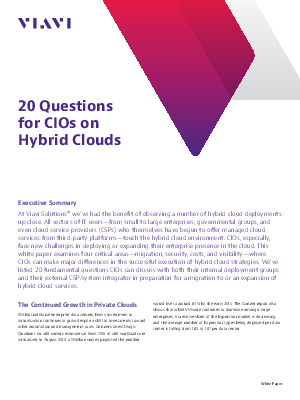 We’ve listed 20 fundamental questions CIOs can discuss with both their internal deployment groups and their external CSP/system integrator in preparation for a migration to or an expansion of hybrid cloud services.